Playskool offers so many great toys for children of all ages, but I would have to say one of their classic toys is one of my favorites, the Mr. Potato Head. I remember playing for hours with mine when I was little. Mr. Potato Head is a go-to gift for my kids, family and friends. It’s simple … yet tons of fun. And there are so many kits and styles you can get for Mr. Potato Head. What little child does not think being a firefighter is cool. The new Playskool Mr. Potato Head Fire Fryer will allow your child to use their imagination ! The Potato body comes with nose, eyes, teeth, mustache, pair of ears, pair of arms, shoes, hat and fire extinguisher. Everything your child needs for FUN! I really think you can not go wrong this holiday season giving the gift of Mr. Potato Head Fire Fryer, besides a great toy it is also at a great price at $9.99 !! Talk about a "hot" potato! Mix-and-match accessories let you create all kinds of "fiery" looks for this fry guy! " 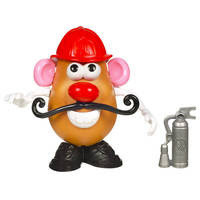 Your favorite potato pal comes with fun mix-and-match firefighter accessories for lots of wacky, "hot" looks! " Potato body comes with nose, eyes, teeth, mustache, pair of ears, pair of arms, shoes, hat and fire extinguisher accessories. " Ages 2 and up. Well, this is cool! The boys love Mr. Potato Head. This would be a great addition to our collection! Oh! We have those accessories for our Potato Head!